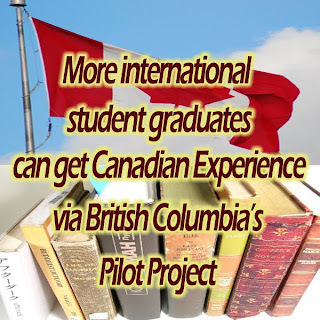 British Columbia, Canada launched a pilot project expanding the Post-Graduation Work Permit Program, to include international graduate students from private Canadian education institutions, enabling them gain Canadian work experience after graduation. Canada immigration has broaden the scope one of its immigration programs giving opportunity for international students to gain Canadian experience after graduation. Canada's Post-Graduation Work Permit Program is now extended to include private educational institutions in British Columbia as a pilot project. Under this program, graduates can apply for open work permits for up to three years. Before this project, the program is open only to international students at public universities and colleges and private degree-granting institutions. A million Canadian jobs are forecasted to be filled in British Columbia by the next decade and one area they are looking at to fill these vacancies is from international students who gained Canadian work experience. It really makes sense for Canada to find international students - who got Canadian education, already comfortable in Canada and would later gain Canadian work experience - very much suitable for permanent resident status. Canada really stand to gain from having all those bright young minds work in Canada in graduation that can eventually lead to citizenship.